We're down to just eight splendid name-inees, and we're happy to see each one of them picking up their own fan groups. The comments section has provided a thorough analysis to complement our own, and we hope to see more nuggets of brilliance as we approach the Final Four. At this point, voters know everything they need to know about the remaining competitors, so I'll use this space to pull back the curtain and reveal how your NOTY sausage is made. 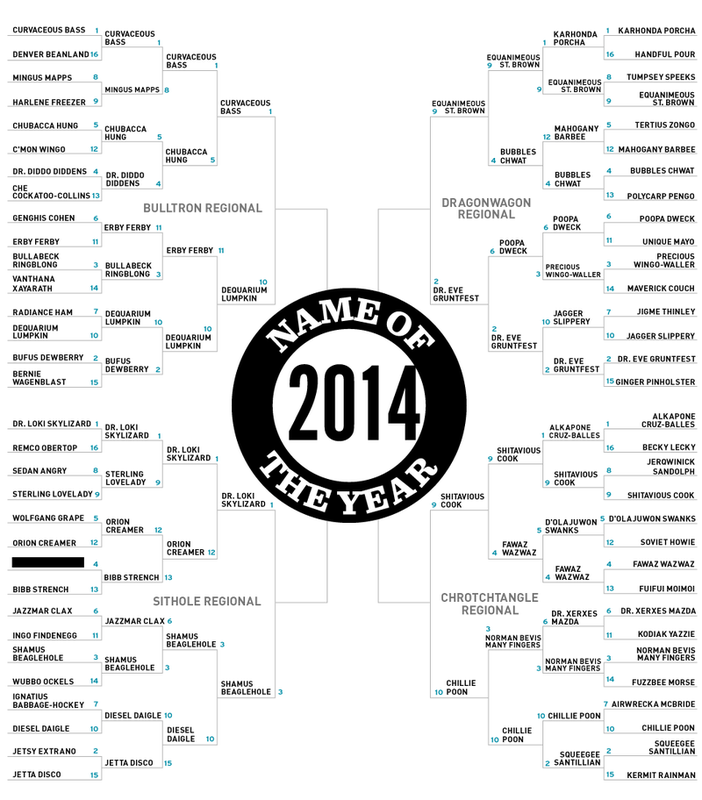 This year, we started with more than 600 names culled from our Name of the Year email account. We were able to eliminate most of those names on first pass, since the majority of suggestions are too sophomoric, too hard to verify, or not quite wonderful enough. Our criteria take care of the rest of the pretenders. Any name previously considered for Name of the Year is immediately eliminated, which takes care of the perennial submission of 2009 Name of the Year champion Barkevious Mingo. If not for this rule, we suspect the people would vote Mingo to a Wooden-Era-UCLA-level run of dominance. Nicknames are out, too. We would've loved to include college football players like Munchie Legaux, Squally Canada, and the particularly popular Ha-Ha Clinton Dix, but their respective real names of Benton, Bryant, and Ha'Sean are deal-breakers. There are lots of great names in movies, too, but the area between real names and stage names is cloudy, and in the interest of integrity, we held back on the likes of Bambi Sickafoose, Rusty Jedwab, and Bewberly Papa. The final hurdle is public presence. If a name can only be found on social media or online databases, we tend to call its veracity into question—not to mention its bearer's right to privacy. Those standards usually get us pretty close to 65, but the final step involves a few agonizing cuts in order to shrink down to exactly that number. Getting rid of those bubble names is the hardest part, but we take on the responsibility for the good of namekind. Polls close 9 a.m. EST Monday morning. Stay tuned for the Final Four.